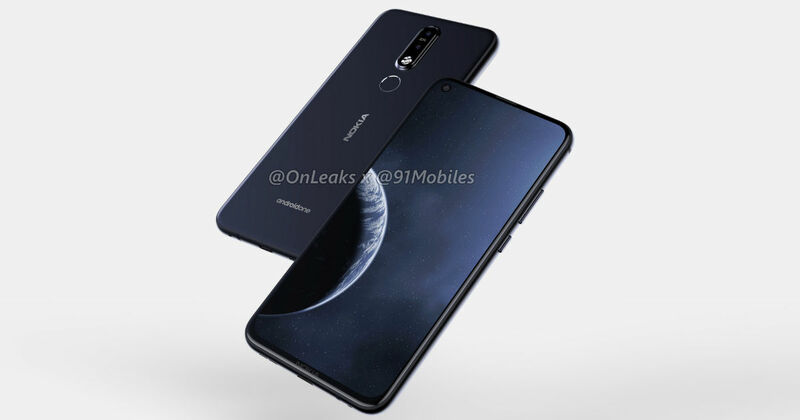 Last week, we brought to you an exclusive preview via renders of a Nokia-branded smartphone with a punch hole display – while we did not have a final name for the handset, it was speculated this model may be named Nokia 8.1 Plus. Shortly after that, a purported specification sheet was tipped online, revealing the details of an apparent Nokia 6.2 (Nokia 6 2019) smartphone being readied for launch. Now, further reveals have claimed that the Nokia 8.1 smartphone that we revealed is actually going to be launched under the commercial name of the Nokia 6.2. Nokia has chosen its mid-range 6 series – rather than the more premium Nokia 8 series – for its first phone with punch-hole display, according to noted tipster Nokia anew. This makes perfect sense, for launching it in the mid-range segment would give Nokia a competitive price point. The Nokia 6.2, as seen in the renders, will feature an in-display front camera — the latest design language in the game of no bezels and notches. According to leaked specifications, the Nokia 6.2 may feature a 6.22-inch display size with full HD+ screen resolution. It is expected to be powered by the Qualcomm Snapdragon 632 SoC, along with 4GB of memory and 64GB native storage, with expandable memory. Other features are seen to include a 16MP dual camera with Zeiss-branded lenses and Nokia OZO-based stereo audio. Being a part of Nokia’s Android One program, the Nokia 6.2 should launch with Android Pie on board. All this combined makes for a very apt mid-range smartphone package and fits better in Nokia’s portfolio as a 6-series device than in the 8 series. HMD Global executives have also stated that the company may no longer launch devices with the ‘Plus’ branding, in a bid to simplify its device nomenclature. This could have played another role in the final naming of the smartphone. HMD Global is set to take the stage at MWC 2019, with the five-camera Nokia 9 PureView set to headline the launch. That said, the company is sure to have more than just one device in its arsenal, and the Nokia 6.2 is now expected to be part of that lineup. While we do not have word about its pricing yet, it is sure to remain competitive.